Fortunately, our Union Square Green Market isn’t just vegetables and fruits – we have cheeses, meats, poultry, fish, plants, and cut flowers to complete the outdoor shopping experience. I was looking for some inspiration on Saturday and found some merguez sausage at the Flying Pigs Farm (www.flyingpigsfarm.com) stall. 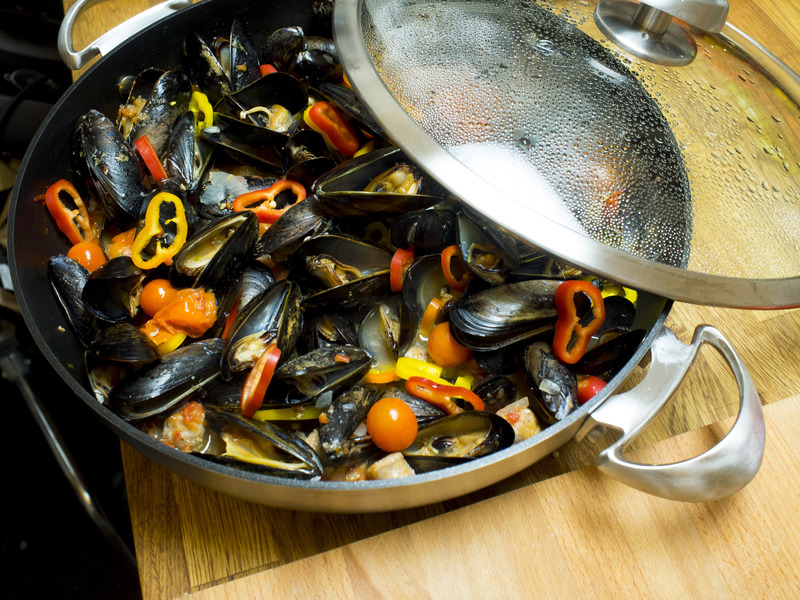 That purchase led to a couple of pounds of mussels at Seatuck Fish Company (www.seatuckfish.com) and the two of them led to dinner pulled together in my beautiful Scanpan covered chef’s pan. Here’s how it came about: I sautéed some onion and garlic in a bit of olive oil until just softened. I sliced up the sausage and added it to the pan and cooked it until it had lost its color. Then I added about 1 cup of dry white wine, brought the mix to a boil and then lowered the heat and simmered for about 4 or 5 minutes to evaporate the alcohol. That was followed with ¾ cup of pureed fresh tomatoes, 1 cup of clam broth, and some basil and chile flakes. I cooked the liquid for a bit to allow the flavors to blend. 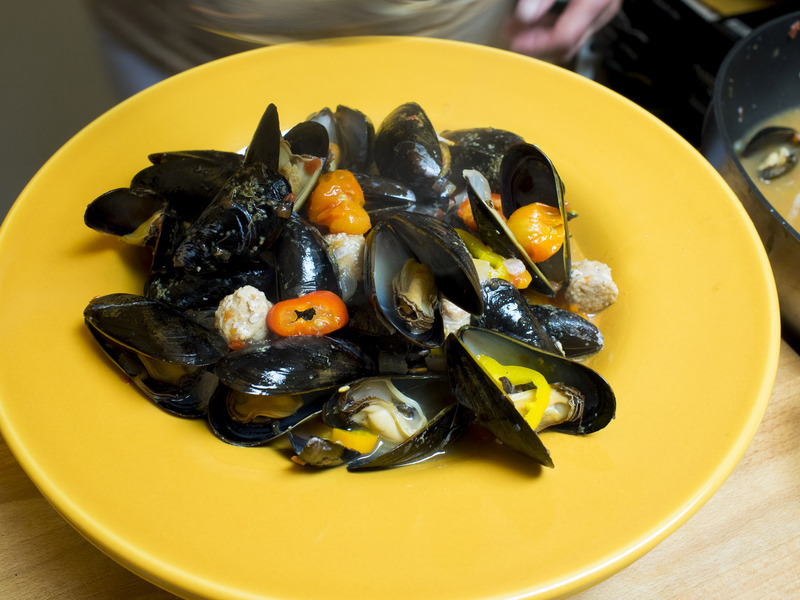 Then I added the scrubbed mussels and covered the pan. Since the lid is glass I could watch the mussels open so just as they began to open I added a big handful of yellow cherry tomatoes and another handful of sliced baby red, yellow, and orange bell peppers. Again, I covered and watched the mussels finish popping open. Voila! A one pot dinner came to the table, 1,2,3!